Pet Sitting – A Day in the life of! Living the dream! A day in the life of! As house and pet sitters working with Nina’s Nannies for Pets, we have been told we are living the dream, staying in numerous beautiful homes across the south of England. I suppose to a point that is true, well at least as far as the lovely homes we get to stay in, but people who make these comments, forget that pet sitting, can be extremely hard work. My wife Jacky and I, come from a background of years of animal rescue and rehabilitation in Spain: often caring for large numbers of furry friends at any one time (up to 20 puppies at one time from birth, to rehoming them across Europe). For this reason, we are known for taking on the larger and more intensive pet sits, ranging from cats and dogs to poultry, horses and occasionally sheep or cattle. So what does an average day in a pet sitter’s life consist of, for one of this larger multiple animal sits? The answer is, that every pet sit is different. Needing to be mindful of the requirements not only for the animals but looking after the home you are in temporary control off. It doesn’t matter if the homeowner says” just “Make yourself at home”, you never do, just in case, if you know what I mean! We have been on sits where the owner is so organised that there is a detailed set of instructions for every day and possible situation we could think of, ranging from meal times to bedtimes. Recommended walks for the family pet and yes, you can take a cat for a walk on a lead! Perhaps an example of one day at one of our busier regular sits may show you that sitting is not the high life but can be intensive and still very rewarding. Four dogs ranging in age from one-year-old terrier, with bundles of energy, 2 older terriers and a fourteen year Great Dane Labrador looking cross (no one is really sure), who likes to do his own thing on walks. One Burmese cat who brings you presents, some are even alive (fun chasing them around), several ducks and chickens, a new forest pony and not to mention a large herd of prize cattle that varies depending on the time of year. Luckily on this old Mc Donald’s farm, there is a herdsman who works on site during the week and visits twice on Saturday and Sunday. Thank god for him as can you imagine having to walk 40 plus cows every day even if there are two of us. Throw into the mix that the farmhouse is over 400 years old and heated by up to three wood burning fires that in the winter have to be kept going 24/7 to keep the house warm for both us and the animals and you start to get the picture. Did I mention the cat is allowed anywhere in the house but not allowed upstairs just in case? The dogs (all of them have different characters) sleep downstairs but are always there to greet you in the morning waiting for the first bathroom walk of the day, a good 20 minutes later it is food time all have different dietary requirements, by the way is the cat still in by the fire I ask, he needs to go out. Whilst I watch the dogs feeding and checking out each other’s bowl if given the opportunity to have someone else’s food Jacky checks the fires are still lit and any ash removed. Ten minutes later pony who we have spoken to earlier lets us know she wants to be moved to the grazing field, that done the very vocal ducks let us know they want to be let loose, in a blur of feathers as we open the pen whilst ensuring the chickens stay put. I swear the ducks are laughing at chickens stuck in the pen as they make their escape into the garden for the day. That done its back indoors for a well-deserved cup of tea and shower before taking the dogs out again. We are lucky that with many fields to walk them we do not have any traffic or roads to contend with only the odd curious cow. On our return, the herdsman is in attendance and we check with him that all is well. By now the animals have been fed and are now resting and happy and we can have breakfast and still only 10 am. Check the fires are still okay before ensuring the house is still tidy and other cleaning chores such as our washing. Now nearly midday the postman has been which woke the dogs, so they need to go out again after the excitement of his visit. The dogs love the cleaner who comes twice a week, so mayhem ensures on her arrival until she has spoken and fussed them before getting on with her work. Mayhem again when she leaves. The dogs then need to have a short walk before we can go out to run our errands. We are allowed a maximum of 3 hours away from the sit but we do not like to be away from out charges for very long as we never know if they are behaving. We return to the welcoming chorus of dog barks and excitement, anyone would think we have been gone for all day. After the excitement settles down all will need a toilet break again after first making sure the house and the fires are still lit and in order. As it is winter and just starting to get dark its round-up time for the ducks, checking the chickens are fed and the water trough is not frozen. Collect any eggs; pick up a carrot for the pony before returning her across the farmyard to her stable. Say goodbye to the herdsman having ensured everything is in order with the cattle. Although there is a herdsman in attendance during the day once he leaves the safety and security of the cattle and the farm now becomes our total responsibility. Luckily, I am happy to take on this responsibility. Now dark but not yet 5 pm and the dogs require their evening meal again, under supervision. The fires are checked again and the woodpile supply for them has to be replenished. That sorted we can get our evening meal before taking out the dogs once again. All the dogs are very eager to be taken out so often as being on a farm it is both unsafe and unwise just to let them out on their own for many reasons. About 8 pm we can all sit down to watch a little TV, joined of course by three of the four dogs as the big old boy has his own resting place. The only disagreement between the dogs is who can get on whose lap for fuss. The third dog usually the youngest purchases himself on the back of the settee usually also on a human shoulder whichever one is free. 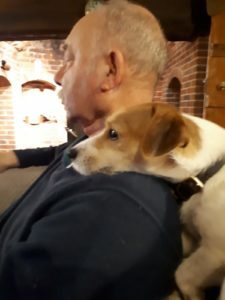 This makes the daily animal and human love in on the settee all worthwhile; we get our animal fix and is also a testament to the care we always endeavour to give having the animals except us so well that they are happy to snuggle up with us. Bedtime arrives with a final walk by torchlight for the dogs; ensure the cat is also in. Stoke up the fires for the night, a security check of the house, making sure the dogs are safe and settled down and then we can retire: another day is done and another to follow. 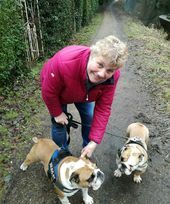 Both Jacky and I started pet and house sitting not only for our animal fix, having returned from Spain, but also because we believe in what Nina’s Nannies for Pets are trying to do. We have now just about completed 2 years as sitters and love it. We have a lot of repeat clients who are happy to put their pets and homes in our charge. All of our clients are lovely to work with and there is not a single pet we do not enjoy looking after. Do we have our favourite houses and pets to look after? The answer is we love all our charges; all are different and keep us on our toes. As to a favourite client, the answer is the same and that would be telling anyway! This year, Nina’s Nannies for Pets have been deeply saddened by the loss of many old friends. Clients and their pets who have used our pet visiting and live in pet sitting service for many years, have reported the death of their much loved cats, dogs and little furies. previously. Jazz, also 20 and another little cat from Eaton Bray, Daisy, a wonderful little Grey rescue cat from Berkhamsted, Phoebe from St Albans and more recently Mr Snuffles a wonderful old Lab from Cambridgeshire. We really will miss them all dearly. On a more pleasant note, Luika our two year old German Shepherd Dog has become a massive hit on facebook! If you would like to follow his antics he can be found under Luika Cole, but more about him in blogs to come. The volcanic eruptions continue to cause problems for our pet sitters, but we have managed to juggle sitters diaries in order to keep clients continuity and hope that the disruption to our time tables are not too long lasting. This year has seen the loss of many old friends, including Mr Speckles, a beautiful lop eared rabbit, Muffy, a 17 years old cat from Berkhamsted, Charley a newly adopted cat who was already 15 years old and Tigger, who was the eldest cat on our books at 21 years of age. It is always a very sad occasion for us and our pet sitters, since attachments are formed in the first few days, and some are frequent sits when their families have property overseas, or indeed, if they are frequent flyers and require a pet sitting service throughout the year. We have also bid a fond farewell to Janet and Ray Marshall, who have been with our company for the last five years. Sadly their last assignment will be in January next year, since they now have family commitments and will not have the availability to continue. They will both be sadly missed by both us, our other sitters and of course their regular clients. The door however, has been left open for their return, if circumstances change in the future. Christmas is almost upon us and we have no further availability for our live in service until January 10, but we do still have spaces for our visiting pet sitter, pet sitting service in the following areas – Hemel Hempstead, Berkhamsted, Bovingdon, Leighton Buzzard, Dunstable, Northall, and Redbourn. I would strongly advise however, that you contact us at your earliest convenience should you require a visiting service for your cats or caged animals, since there are only so many hours in a day and we do endeavour to finish by 4 p.m. on Xmas Eve, Xmas Day and Boxing Day. There is also a preliminary visit required and since we only have the weekend in order to see new clients you will appreciate how little time there is left. Here in the office we often receive the odd strange request, some of which are not to be taken seriously! However, the most recent (a couple of hours ago), really took the biscuit. A gentleman calling himself Mr Shere Khan, asked if we could care for a one eyed, incontinent anaconda during June – PLEASE. I rather think that my reply stole his thunder when I explained that our current insurance would not cover this type of pet! Needless to say the conversation was hastily terminated!!! Did I ever tell you that a pet sitters life is never dull! A Blooming Good New Year! Wow, what a great start to the New Year! Our phone has continued to ring off the hook and bookings for this year have been flooding in. It seems that even during a recession, people are keen to continue with good quality care for their pets and continued home security during their holidays. Our Dorset, Somerset, London, and West Sussex branch have been particularly busy and we are heartened to see other areas of the country doing equally as well. Details of our new pet sitters will follow shortly. Heavy snow fall was particularly unwelcome recently and some of our sitters struggled to reach their destinations. However, a pet sitters life is never dull and it took determination and dedication to battle through. I am hoping that we have now seen the last of adverse weather conditions and we are all looking forward to Springs arrival and the promise of some much needed sunshine.